After the enormous critical and commercial success of The Sixth Sense, M. Night Shyamalan went from a guy who couldn’t get arrested to a guy who could do anything he wanted. He was used to having his work pushed around and disrespected by studios; his first film was shelved for three years and his Sixth Sense screenplay got the president of Disney fired when the upper echelons of the company decided it had no commercial prospects. But that unmarketable art film ended up making $600 million, so all eyes were on him when he followed it up a year later with the dense, slow-moving Unbreakable. The haters came hard and fast, penning plenty of the snarky headlines you’d expect from critics unwilling to indulge an unapologetically ambitious young hotshot. “Unbreakable is a film that begins with a train wreck and then, figuratively speaking, becomes one,” snapped The Boston Globe’s Jay Carr. The erudite litterateurs at E! Online kicked a phat rhyme–“Scare us once, good for you; scare us twice, well, that's tough to do”–before keeping with the train puns: “It all relies too heavily on a payoff that derails before its time” (har har!). John Anderson of Newsday called it “mind-bogglingly sophomoric.” Really, John? Was your mind really boggled? But Unbreakable is far and away M. Night Shyamalan’s best film, and stands as the only time he has ever completely fulfilled his modus operandi, which is taking timeworn legends and populating them with real people. The Sixth Sense fleshed out a regular ol’ ghost story by letting us get to know the ghost. Signs was War of the Worlds from one family’s perspective. The Village was Little Red Riding Hood as a political metaphor. Lady in the Water was a mythology-heavy fantasy story told through the eyes of a sad sack. Sometimes this works (Signs is pretty brilliant until the alien shows up) and sometimes it doesn’t (Lady in the Water and The Village define “uneven”), but Unbreakable is pure perfection. It makes The Sixth Sense feel like a dry run for a coming masterpiece. Unbreakable’s archetype is as superhero origin story, arguably the greatest American legend there is. But the film doesn’t let us know that at first. We discover the destiny of our hero, the melancholy David Dunn (Bruce Willis), with him. When en route to a job interview, the train he’s on crashes. He’s the only survivor, and there’s not a scratch on him. The story particularly intrigues Elijah Price (Samuel L. Jackson), an eccentric comic-collecting millionaire with a disease that causes his bones to shatter at the slightest impact. If there’s someone as fragile as him, then by some cosmic law there must be a polar opposite, someone who will give his painful life some kind of meaning. Though Dunn initially brushes him off, he slowly realizes that Price is on to something. It’s also a technical masterpiece worthy of being studied in film schools, making the newly released Blu-ray edition a must-have. Eduardo Serra’s richly textured cinematography makes wintry Philadelphia look like a crystalline no man’s land. Editor Dylan Tichenor–best known for his work on highbrow pieces like There Will Be Blood and The Royal Tenenbaums–keeps everything enigmatic when it could be boring, and scores major points with the chilling train crash montage. It’s Shyamalan’s ingenious concept of a truly everyman comic book story that makes Unbreakable a classic, though. 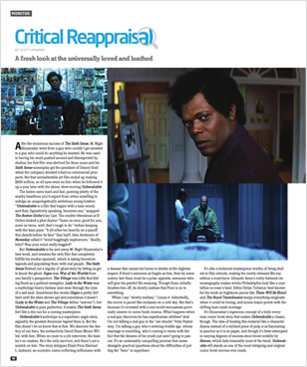 The idea of treating this material like a character drama instead of a stylized piece of pulp is as fascinating in practice as it is on paper, and though it’s been attempted in varying degrees of success since (most notably by Heroes, which fails miserably most of the time), Unbreakable still stands as one of the most intriguing and original comic book movies ever made.